Your cat's tail helps her with balance. It aids her in jumping and navigating balance beam-type situations. It even helps keep her upright when she's tearing along at high speed and needs to make an abrupt hairpin turn. But your cat's tail has another crucial job: it helps her communicate. What Does Your Cat's Tail Position Mean? If your cat's tail is held straight up in the air above her, it means she's feeling confident and friendly. She may give the end of her tail a quick flick or carry it with a slight bend in the end, which is an invitation to talk to or pet her. An upright tail that quivers a bit means your cat is excited about something positive about to happen. She may think you're about to give her a meal or bring out her cat toys. However, a cat with an upright, quivery tail while backing up to a flat surface might be getting ready to urine mark. This is most common in male cats that aren't neutered, but some neutered males and females exhibit territory marking behavior through spraying, too. A horizontally held tail may indicate either relaxation or concern. To decipher which it is, consider whether the tail is loose and relaxed, or stiff and concerned. Look at the rest of your cat's body language, too: are her ears up and her facial muscles relaxed or is she tense and staring intently? If your kitty is standing or lying down with her tail wrapped around her body, she is feeling relaxed and happy but would probably prefer not to be approached. She's most likely interested in taking a nap or simply chilling out to watch what's going on around her. Be sure to always take all of your cat's body language into account when attempting to interpret her mood. Don't just single out the tail, but pay attention to the eyes, ears, and general muscle tone, as well. 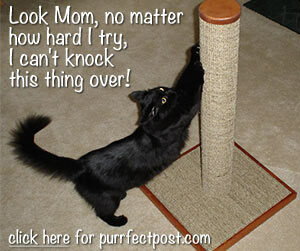 If your cat's tail is puffed up, it means she's afraid. The rest of her fur may be puffed up, too, because she's trying to make herself look large to turn off an attacker. Often, a kitty that is afraid will also hold her body and tail in strongly arched positions, straightening her legs to stand as tall and look as big as she can. This cat shouldn't be approached; she's ready to defend herself. A twitching tail usually means that your cat is stalking something. A cat that is watching prey may twitch her tail as the only sign of her excitement. Have you ever seen a cat wag her tail? It might look like a dog's happily wagging appendage, but when a cat does it, it often indicates irritation. If you're petting your cat and her tail starts wagging or whipping, she's probably done with the love session and wants to lie next to you without being touched. However, there are certain individual cats and breeds that have more of a tendency to wag their tails when they're happy, more like a dog does. Watch the kitty's other body language to help you determine whether a cat's wagging tail means "let's play," or "leave me alone now."